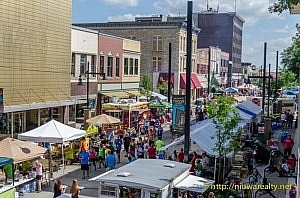 Share the post "The Welcome of RAGBRAI"
The day started a bit early for me to get to the office and find a place to park away from the cordoned off streets in the Historic Downtown area. Fortunately I was able to find a parking place in one of the public parking lots about a block from my office building. I took care of some errands and phone calls before I changed my clothes and went outside and made sure all my front windows were washed so the foot traffic could see the flowers blooming in my window. I had two different people come up to me and asked me if I was the owner and I told them I was. They proceeded on to say how beautiful downtown Mason City is and asked questions about several of the buildings in the area. One of them was a couple who was from Kentucky and doing the whole RAGBRAI ride across Iowa. I received a call from a client telling me a heartfelt story of some perfect strangers who were here riding a NAVY bus. They were parked next door to where an elderly couple live who just received word that their son died died early this morning. They stepped completely out of their own lives and came together and had flowers delivered this morning to the grieving couple. I was so terribly moved by their actions. It is yet a confirmation that there some really good people living in our country. I left my office with camera in hand about 1:30 this afternoon and finally decided to walk back around 6:30 PM. Wow! I didn’t realize being a photographer for one afternoon was so much work. I can now appreciate how much work being a full time photographer is on a daily basis. I haven’t been in a crowd so large in so many years I can’t even remember. It was quite the delightful experience. One of the photos that is being posted is of a man who represents a group of riders who have for many years planted a tree in every city the group stay for the night. That was yet another moving story told me today. Several of the visitors thought I was with the local media. I told them I was a Realtor out taking photos to post on my website. I attempted to get as many photos taken of not just the crowd but of the different activities. From young men and women doing pullups for the Marines, vendors cooking, people strolling, smiling faces, charming and sometimes very bold outfits people were wearing, views from above as well below the crowd, and everything in between. Some of the photos I have omitted because I promised myself I wouldn’t take any photos that would be considered embarrassing to whomever is in the picture. If I were not so exhausted from the wandering about looking for acceptable shots, I would likely be there into the night. I am completely confident that the RAGBRAI visitors are having an exceedingly enjoyable stay in our fair city due to all the work that the many committees and citizens have done to make them welcome. I do hope they come back soon. First of all....Joe Chodur really doesn't like talking about himself but this is what we have found out about him. * All logos are owned and copyrighted by the companies represented here.